Home page > News > Teplov H150 infrared warm plinth. Teplov H150 infrared warm plinth. The electric infrared warm plinth. The infrared warm plinth - is a new development of "Ukrprom", which perfectly combines the compactness and proven effectiveness, inherent in all Teplov™ products. We have high aesthetic and functional requirements for modern heating systems, as most often we need to quickly install a heating system without significant changes in the decoration. The warm plinth can be a great solution in this case if properly assess its capabilities. Infrared heating systems are often called the European heating, having in mind a concept of high quality, innovative technology and the focus on resource and cost saving. It is difficult to argue, as of today, the EU is a platform for the development of natural resources renewal projects, low-carbon policy, etc. The infrared warm plinth has been popular in Germany, Poland, the Czech Republic and other EU countries for a long while. To make the most beneficial use of such a heating method you should learn its specifications. The electric warm plinth is a kind of the wall-mounted infrared heater with a nominal power of 150 watts. Light (2 kg) and compact (only 20 mm thick) design will dispel any concern about the appearance of the room, moreover, we can change the body color according to your wish. The infrared plinth can be purchased to provide a primary heating in the room, because despite its small capacity compared to other infrared heaters, it has a heat output level of the lamellas five times higher than the effectiveness of similar models. Due to anodized aluminum lamellas, which emit infrared rays, the electric warm plinth effectively warms the surrounding surfaces in the room and, above all, the wall on which it is mounted. Installation of such a heating system around the perimeter will create a powerful heat curtain against the ingress of cold air from the outside. It is proved that 80% of energy consumption goes to heating the walls, ceiling and close objects and only 20% of the heat goes to heating the air itself. This is a strong performance since other methods of heating (convector heaters, radiators) give 70-80% of the heat to the air, half of which quickly rises and another half escapes through the cracks, door and window openings. 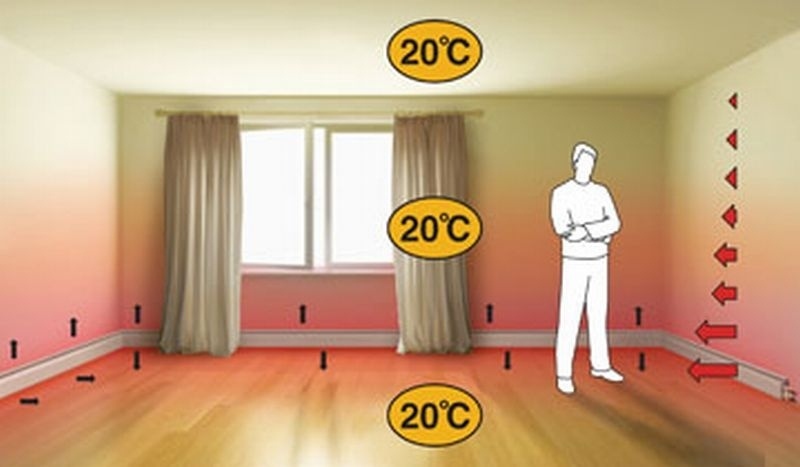 The infrared warm plinth is advisable to install on periphery walls because they keep most moisture and cool the room. The "warm plinth" system infrared heaters allow you to get rid of moisture in the walls without affecting the level of humidity in the room. This is a big plus in favor of infrared heating systems since the air stays clean and safe, and the absence of a convective heat flow prevents any unnecessary circulation of dust and germs. You can buy the infrared warm plinth for such spaces as living rooms, bedrooms, hallways, bathrooms - it's regarding household heating. In houses or apartments, such heaters will create comfortable conditions within a few hours after the launch since the perceived temperature of infrared heating is always higher than the actual, which helps to significantly save on heating. The "warm plinth" system in offices and industrial premises will be effective in heating of small areas (up to 3 m2), and as an additional heating source for the areas up to 5 m2. It's worth noting that these area figures relate to the use of a single module, but when you install a system consisting of 2 and more modules, the heating efficiency significantly increases, so such systems can be used in rooms of different sizes. Wall-mounted heaters Teplov H150 are the product of the technical development of the Ukrainian company "Ukrprom", which for many years has been a leader in Ukraine in the installation of infrared heating systems in private and state-owned industrial enterprises, malls, halls, shops and, of course, in household premises. Comfortable conditions of cooperation are backed by the presence of the necessary documentation of the quality and safety of Teplov™ infrared heaters.